To look back at the progress of Sarasota Tomorrow initiatives in 2015, past four issues of this Sarasota Tomorrow Insider electronic newsletter have been distributed to all Chamber members. Each issue focused on the major strategic components of Sarasota Tomorrow: Targeted Development, Education & Workforce Development, Improving Our Business Climate and Building on Past Sarasota Tomorrow Successes. This issue looks ahead at the current and future initiatives Sarasota Tomorrow is working on to secure a more prosperous future. Build a positive climate for Sarasota employers and the jobs they create; as well as promote an infrastructure system that will support a growing and prosperous community. * Support long-term financial solutions for area transportation issues including alternative methods of travel to meet expected demands and to allow workers, customers, and visitors optimal mobility. * Advocate for a positive business agenda to encourage business creation, relocation, growth and sustainability throughout Sarasota County and the region. Advocate for strategic, targeted development that accelerates economic growth, revitalization and attainable housing that will increase the community’s overall economic strength. * Provide business oriented participation in developing attainable housing solutions for the current and future workforce and help employers attract and retain a workforce that can grow with the region’s needs. * Create economic development opportunities that allow for increased tourist capacity, business growth and diverse employment foundations in downtown and other key areas. * Target enhancements to two of the county’s key corridors, US 301 and US 41, through planned improvements to create vibrant connectors of regional activity. Work to secure a strong workforce by making sure a variety of educational and training pathways are available to our youth and other residents, allowing greater Sarasota to compete and prosper in the ever-changing economy. * Expand Talent4Tomorrow’s programs that focus on workforce preparedness through training partnerships and opportunities, as well as the expansion of college internships. * Collaborate with community partners to broaden awareness of and accessibility to educational and financial pathways to higher education, including college and job and skills certification programs. * Advocate for programs and initiatives that bridge the gap between high school and post-secondary education. To look back at the progress of Sarasota Tomorrow initiatives in 2015, four issues of this Sarasota Tomorrow Insider electronic newsletter will be distributed to all Chamber members over upcoming weeks. Each issue will focus on the major strategic components of Sarasota Tomorrow: Targeted Development, Education & Workforce Development, Improving Our Business Climate (high-lighted in this issue) and Building on Past Sarasota Tomorrow Successes. * Represented the business community in meetings with County staff, the Planning Commission and the County Commission, ensuring the voice of business was included in the county’s long-term vision. *Supported the fiscal neutrality of new developments in the eastern portion of Sarasota County, which will allow good projects to be financed ensuring the development pays its fair share of infrastructure. 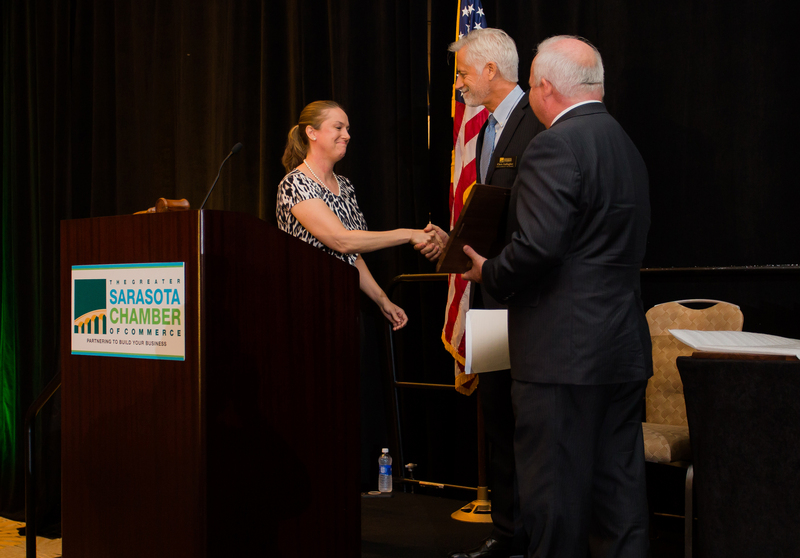 * Advocated for a flexible approach to the plan while maintaining Sarasota’s longstanding environmental stewardship. * Participated in the process to update the Plan in areas such as land use, design and quality of life, allowing for a voice for business in critical areas affecting Sarasota County. * Involvement through member surveys and advocacy in the economic development parts of the Plan, allowing for critical insight from a business point of view. * Regularly discussed topics ranging from reducing commercial lease taxes to voter turnout. *Engaged elected officials and public employees in a variety of business related issues, resulting in many Chamber suggestions being taken into consideration. *Worked with area organizations and groups on Sarasota County issues including workforce housing, transportation and enhancement of the bayfront. July 4, 2015 – How Can We Turn Up Turnout? November 7, 2015 – Impact Impasse – Who Foots the Bill? To look back at the progress of Sarasota Tomorrow initiatives in 2015, four issues of this Sarasota Tomorrow Insider electronic newsletter will be distributed to all Chamber members over upcoming weeks. Each issue will focus on the major strategic components of Sarasota Tomorrow: Targeted Development (high-lighted in this issue), Education & Workforce Development, Improving Our Business Climate and Building on Past Sarasota Tomorrow Successes. Supporting the development of core business areas. Our Downtown Economic Development Coordinator continues to work closely with Sarasota city staff and others promoting investment in our downtown. * Facilitated real estate development. Over 35 projects with an estimated construction value of $433,290,000 are currently underway or in the pipeline. * Served on city teams for projects such as Fruitville Road enhancements and bringing new hotels to the area. * Helped new downtown merchants with opening stores. * Worked with companies looking to relocate to downtown. The North Trail along U.S. 41 is receiving needed revitalization and economic development, advocated for by The Chamber. * Planned a series of 10 traffic roundabouts connecting the airport and downtown, the majority of which are currently planned and partially funded. * Advocated for our transportation priorities at the Sarasota/Manatee Metropolitan Planning Organization meetings. * Provided economic market studies to FDOT representatives, which helped overcome their reluctance to support accelerated funding from the federal government. Sarasota Tomorrow is playing a key role to move the Bayfront forward. This is the largest metro-downtown waterfront location planning opportunity in the state of Florida. * Utilized top Chamber officers in the Bayfront 20:20 Coalition to improve this unique area and allocating Sarasota Tomorrow funds. Sarasota Bayfront 20:20 is now entering its Phase III Partnership: Master Planning in order to reach its goal. This phase will involve site planning, facility planning, outreach and fundraising. Thank you Sarasota Tomorrow Investors! One year ago as I accepted the Chair’s gavel at the 2014 Annual Meeting, I watched former chair Lisl Liang announce the 2014 Kerkering Barberio & Co.’s Chair’s Cup Recipient, Lisa Krouse. Even then I began wondering who the worthy recipient for the 2015 Chair’s Cup might be. In late-September, 35 community leaders traveled to Louisville, Kentucky as part of the Leadership Expedition to Accelerate Progress (LEAP). The trip, hosted by The Chamber’s Sarasota Tomorrow Initiative in partnership with the Economic Development Corporation of Sarasota County, serves as an opportunity for area leadership to learn more about the successes of peer and aspirational communities that might be emulated locally. As in years past, the Sarasota delegation included elected officials, City/County staff, local for-profit and non-profit CEOs, key education leadership, and other key civic and business stakeholders. Insights gained from past trips have helped local groups collaborate to create the successful Precision Machining program at Suncoast Technical College, explore new public art efforts, launch the Talent4Tomorrow initiative to improve our region’s educational attainment and workforce development outcomes and create the Sarasota Bayfront 20:20 effort to maximize that key area of our community.